I have already gone insanely over my budget for the year but I had a $30 Old Navy Supercash off of a purchase of $75 and I could not pass it up! My original plan was to buy a few things for myself and use the rest of the $75 to buy Christmas gifts. 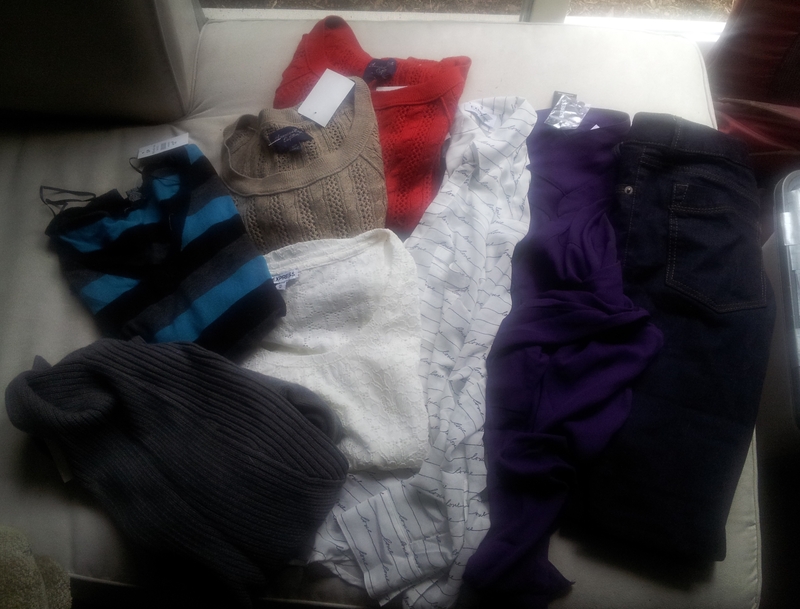 Instead Mr. BMW found two pairs of sweatpants that he really liked and I got a few pieces for an amazing deal. All of these are pretty great basics so hopefully they will get a lot of wear – then again my whole wardrobe is essentially basics. But after completing #StyleMeOctober, I feel like I know my style and the pieces that works for me much better. So hopefully I will be able to start paring my wardrobe down to only my personal favourites and essentials but that will be at least a few months down the road. These three were a great purchase at only $6 each plus tax! Unfortunately the first time I wore the white with black dots one I dripped a fudge popsicle on it in a place that is not easy to hide with a scarf. Luckily the spot should be easy to hide under a cardigan. I have not washed it yet so maybe the stain will come out! I still have not worn the red or blue striped shirt yet. 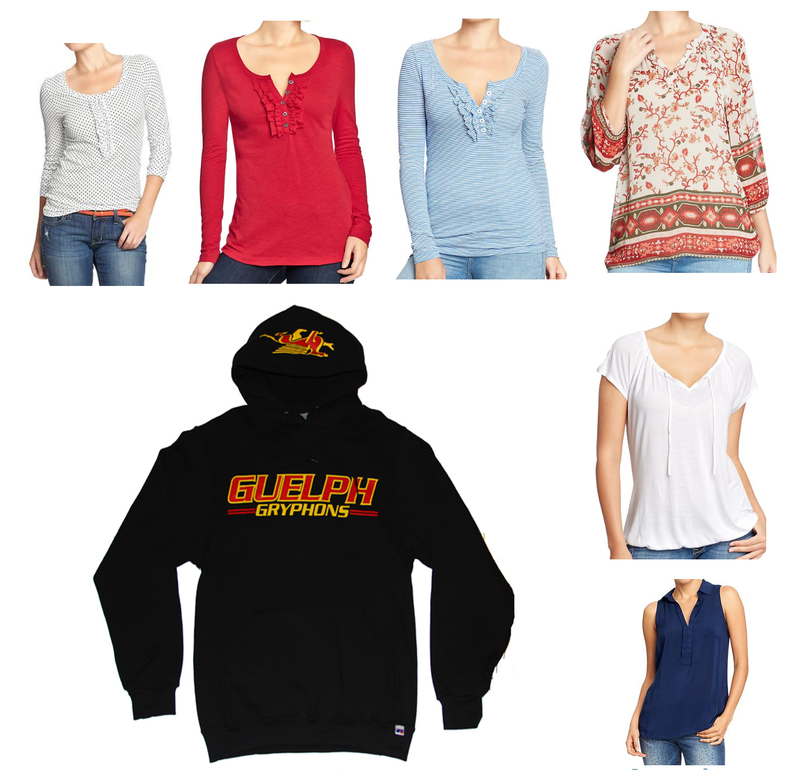 I could not help but buy another school spirit sweater – the fact that our mascot (a gryphon) was on the hood is what sold me on it! Also this is the perfect school sweater. I could not put this shirt back. I passed it twice and Mr. BMW hated it in on the rack but I knew I had to try it on. And I am really glad I did – this is the perfect autumn-inspired top and I plan to wear it in a lot of different outfits. In fact I wore it the day after I bought it! I have had a white, casual blouse on my shopping list for months and I finally found one for a really great price. I could not pass this up when I tried it on – it looked wonderful and I can not wait until the spring to wear this! I really did not need to add another tank top to my collection but I could not resist. This is the perfect neutral blouse that can be worn with everything. If this sees a lot of wear then I might add a similar tank in white and/or black. As always I am linking up with Franish for Budgeting Bloggers. I am making no goal for November because I know that I will have very little shopping time this month with final assignments and participating in NaNoWriMo. Who am I kidding – I will probably end up buying something! Sorry about the low quality of the photograph, that was the best lighting I could find at the time since it was a gloomy day. I definitely need to get a camera other then the one on my cellphone. This is my very first budgeting bloggers post and I am already way over my monthly budget. This was the month of back to school and fall shopping. My orientation week at school starts on the 31st but my first class is not until September 5. My goal when shopping for back to school was to fill in as many wardrobe holes as possible and still pick up pieces that interested me. I went on four different shopping trips but only bought something on three of the trips. The striped sweater from Urban Planet was an impulse buy – I bought it because I have a similar one in red, black, and grey that I really enjoy wearing and Mr. BMW approved of it. The grey open front cardigan from H&M has been on my wish list for at least half a year because they are all over pinterest. I feel like this will be the perfect sweater in the fall and winter and will definitely become a staple. The American Eagle knit sweaters at Winners were definitely something I have been looking to buy for a while now. Last year I fell in love with my black, grey, and white sweaters and knew I wanted to pick up a red one. When I saw the tan/brown colourway, I just could not leave it. I plan to get a lot of wear out of these in the holiday season. The lace top from EXPRESS was too beautiful to leave behind. I had been looking for a short sleeve, lined lace top for a few months and while this shirt is neither short sleeve nor lined it definitely fills that closet hole. I have already worn the top once and can not wait to wear it again. The two Portofino shirts were impulse buys – I fell in love with the love print and for the sale I found I could not leave the purple one behind. I love wearing sheer, chiffon shirts in the fall and winter. Because I have a lot of red in my closet, I wanted to add other colours (and purple looks stunning on me). The STELLA jeans were another impulse buy. I do need new jeans as a few of my older pairs were beginning to become very faded. The first time I wore these, I absolutely love how comfortable they are. I definitely plan to buy more in other washes if they ever go on a larger discount. Overall I am happy with my purchases this month even though I will not be able to wear most of these until the weather cools down. Hopefully in September I will be too distracted by school to do much shopping. If I do fail to resist the temptation then I plan to spend that money either purchasing an item on my wishlist or filling my closet holes. One of my main goals for September is to find a red cardigan as my old standby has become worn out – this has been hard because the only shade of red I have been able to find in cardigans is maroon/burgundy. Another goal I have is to buy a patterned summer-fall dress that is NOT predominately blue. I have recently gotten back into the idea of wearing dresses for casual occasions but everything I have is mainly blue! I would also love to find a few more printed or solid casual skirts that are a more modest length then what I already own. I also plan to do a thrift store challenge sometime in the next few months – maybe trying to purchase an entire outfit for only $20 or to see how many pieces of clothing I can find that I love within a small spending limit? With only $75.76 a month remaining I definitely need to think through my purchases more thoroughly – especially considering I am hoping to do some online Black Friday/Cyber Monday shopping in November and some online Boxing Day shopping in December. I am linking up with Franish for Budgeting Bloggers – check out if anyone else failed to follow their budget like me! I have gotten into a terrible habit of dropping by Tim Horton’s in the morning before work to grab an Egg Breakfast Wrap and a Large Frozen Raspberry Lemonade. Each trip costs me $3.76 and that adds up fast. Luckily, most of my upcoming shifts at work are evening shifts, but for those that are in the morning I will just wake up earlier and eat breakfast at home. Similarly, I have the tendency to buy A&W, Wendy’s, or McDonalds whenever I have a lunch break during a shift. Not only is this extremely unhealthy but it is also expensive. Instead, I plan to bring my own lunch and snacks to work or to use up one of my remaining fast food giftcards to buy food. Despite my interest in cars, I am no good under the hood – so I am going to leave my upcoming oil change to the professionals at my work and maximize on my employee discount. Rather, instead of paying for a drive through or coin operated wash, I will wash my very filthy car at home. After all, I did spend a lot of money last year on buying the supplies necessary for at home car washing and then I rarely use them. For the past few months I have gone over my phone’s data plan considerably. Thankfully, my plan only charges me a fee in $5 increments based on the amount I go over. This $5 a month does add up over the months and if I continue this habit it would cost me $60 a year. Saving money starts with small changes. I have plenty of school supplies that I have accumulated over the past few years that are either brand new or only half used up. Before going to the store and buying everything brand new – I plan to assess the school supplies that I already have and go from there. Also, I have a $50 gift card to Staples and a $100 gift card to Michael’s craft store that I hope will cover all my school supplies needs. Textbooks can be very expensive for University. Rather than buying every book brand new, I plan on finding a less expensive alternative – such as used books, loose leaf books (one you would into your own binder), or electronic books. The next few months are going to be hard on my wallet but by cutting as many unnecessary costs as possible, I will be able to save as much as possible. What are some suggestions you have for saving money this month?